My Good Son’s Death Was Unjust! On June 3, 1989, Li Ping and his classmates found out that classes would resume the following week. That night, he and several classmates flagged down a truck in front of the university. They wanted to go to Tiananmen Square to have a look. But the truck had to stop before they even reached Muxidi, as tens of thousands of Beijingers had flooded onto Chang’an Avenue, not knowing what was about to happen. So everyone got off the truck and began walking east. At that point, martial law troops began shooting into the crowd. Li Ping was shot in the left cheek, and a classmate took him to Beijing Fuxing Hospital. Due to the severity of his injuries, he died in the early morning of June 4. His body was placed in the Fuxing Hospital morgue; later, the school moved it to a small hospital near Capital Normal University. 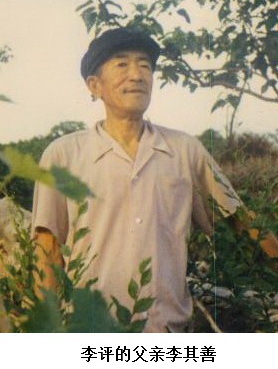 Li Ping’s father, Li Qishan. Afterwards, the school never notified his family. It was a classmate from Jinzhou, Liaoning Province, who notified the Li family. A few days later, Li Ping’s two older brothers went to Beijing, and, soon after, Li Ping’s father and younger brother also rushed to the school. A university vice-president and a department head greeted them and gave them 2,000 yuan in bereavement funds. Li Ping was cremated and his ashes were buried in his hometown. On September 23, 2013, we traveled by bus from Dalian to Dandong, and then changed buses to go to Fengcheng. We were greeted by Li Ping’s older brother, Li Zhi (李志), who was in the kitchenware business in Fengcheng. Li Ping’s mother, Sun Shufang (孙淑芳), lived with him. The children were all quite filial. But compared to other siblings, Li Zhi was in the best position to provide for his mother. We went to the Li household to see the 78-year-old Sun Shufang, an average rural woman living in a farmhouse with an inner courtyard. When we told her the reason for our visit, the elderly woman was so happy and excited that she shook our hands and didn’t let go. Due to a stroke and a stutter, her ability to express herself was limited. During our conversation, she repeatedly said, “My good son’s death was unjust. If not for this incident, my husband would not have died so early.” Although this mother lacked the ability to express herself, she had hope in her heart—hope that the government would provide an explanation for her son’s death. In her relatively worry-free life, she’s waiting for that day to come. We encouraged her to live happily and healthily, telling her that the day is bound to come. Seeing her kind smile, we were incomparably comforted. Li Ping’s mother, Sun Shufang. Li Ping’s father was a Korean War veteran, the head of the cooking team. He was an honest and kind man and educated his sons by his own actions. The Li family’s background was seen as problematic: their great uncle was a rightist, which affected the next generation’s prospects. Although the children wanted to join the military, they were unable to do so. Because there were so many children, life was difficult, and Li’s father and his siblings returned to the countryside to farm. Only Li Ping got into a university in Beijing. At that time this was an extraordinary feat—he became the first person in the area to go to university. Whenever his parents walked through the village, they received praise from their neighbors. In Li Zhi’s words, “my parents’ faces would light up with pride.” When Li Ping died, the hopes of the entire family were dashed. The whole village grieved for him. It was also a serious psychological blow to his father. His pulmonary heart disease worsened and medical treatment was ineffective. And he left this world with eternal regret. When Li Ping’s ashes were returned to the village, hundreds of villagers received them at the train station—a magnificent and moving scene. In their hearts, the people regarded Li Ping as their hero, who continued to live despite his death. We ought to have gone to Li Ping’s grave to pay respects, but it suddenly began to pour. And we didn’t go because of the long distance. We just let this heavy autumn rain carry our deep sorrow and remembrance there! We sent our condolences to Li Ping’s soul in heaven: “With your father to accompany you, you won’t be lonely, and your mother is living well under the care of your siblings, don’t worry!” We will persevere in the path of justice, unafraid of danger, and uphold our three appeals in order to obtain justice for our loved ones who have perished. 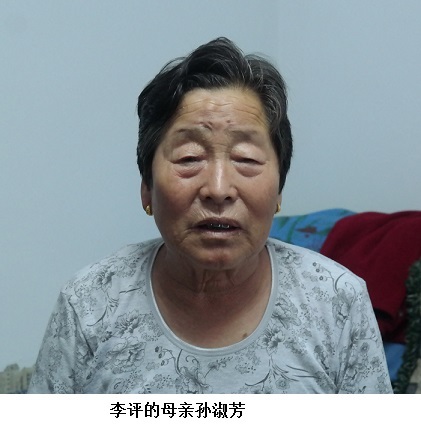 Li Ping’s mother is enjoying her later years peacefully under her children’s care. This is a victim’s family member who makes us feel gratified. We wish her a happy and long life. © All Rights Reserved. For permission to reprint articles, please send requests to: communications@hrichina.org. Yin Min (尹敏) and Zhang Yanqiu (张彦秋) are members of the Tiananmen Mothers. Li Ping (李评), born in 1967 in Fengcheng Village, Dandong, Liaoning Province, was a third-year student in Beijing’s Capital Normal University’s Political Education Department in 1989. On the night of June 3, he was shot in the left cheek. He died in the early morning of June 4, at age 23. He was an outstanding student cadre. Also in "Until the Last Breath"
There is Always a Wound in My Heart—How Can I Forget?